Stained glass is both a fine art and a craft, brought to America by European colonists, and used as a major decorative feature in American homes for more than two centuries. 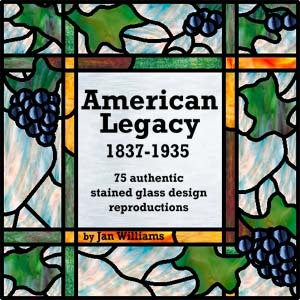 The American Legacy pattern collection features 75 authentic vintage stained glass designs from the United States dating from 1837 to 1935. European themes such as family crests, windmills and Old World ships are echoed among the American motifs. In this collection you will find stained glass transoms sporting house numbers which are still a common site in Boston, as well as an eclectic array of authentic decorative window designs from domestic dwellings, civic buildings, hotels, restaurants and a Midwestern train station. Patterns include florals, sprays of blossoms and single buds, fruited vines, urns, stately tulips, fish and a charming swan.